Jordan Bone was named SEC co-Player of the Week for his performances, averaging 18.5 points, 9.5 assists and 5.0 rebounds per game while shooting 70 percent from the floor and 78 percent from beyond the arc. With 18 points and 10 assists at Texas A&M, the Nashville, Tennessee, native became the third Vol ever to have three points/assists double-doubles in a season, joining Tyrone Beaman (1982-83) and Rodney Woods (1974-75). Bone was a perfect 7-of-7 from the floor and knocked down a career-high-tying four 3-pointers. Bone’s play this season also earned him recognition as a Top-10 finalist for the Bob Cousy Award. He has nearly doubled his scoring production this season at 13.6 ppg while shooting a 47-percent clip from the field. He ranks sixth in the country and leads the SEC in assist/turnover ratio (3.6) and 10th/1st in assists per game (6.6 apg) on the season. Cuonzo Martin is set to make his first trip back to Thompson-Boling Arena since parting ways with Tennessee in 2014 after a Sweet Sixteen run. Jordan Geist has been the best player for Missouri (11-9, 2-6 SEC) so far, leading the Tigers in scoring (13.9 ppg), assists (3.2 apg) and steals (1.1 spg). Mark Smith (12.6 ppg, 5.5 rpg, 1.6 apg) is close behind Geist in the scoring column. The two have combined for more than half of the team’s 3-pointers this year, accounting for 89 triples between the two. Smith paces the Tigers with 48 treys while shooting at a 46-percent clip from beyond the arc. MU is the best team in the league when it comes to shooting from beyond the arc, connecting on 38 percent of its shots from deep. The all-time series between Tennessee and Missouri is tied at 7-7, dating to 1961. The Vols have a 4-2 edge when the series is played in Knoxville. Extend Tennessee’s program-record win streak to 17 games. That would also tie the longest win streak of Rick Barnes‘ 32-year head coaching career. Stretch the Vols’ home win streak to 21 games, dating to last season (it is the longest home win streak of the Barnes era). Give UT an 10-game win streak in regular-season SEC contests. Tie as UT’s best SEC start since the 1981-82 season (8-0). Make the Vols 6-1 all-time as the AP’s top-ranked team. Give Tennessee its longest-ever win streak in regular-season SEC games (13). Cuonzo Martin coached the Vols for three seasons from 2011-14. VFL and former All-SEC Tennessee forward Jeronne Maymon (2010-14) is now a graduate assistant on the Mizzou basketball staff. Tennessee’s average home attendance of 18,406 ranks fourth nationally. This is Rick Barnes‘ longest win streak since he led Texas to a 17-0 start to open the 2009-10 season. At tipoff Tuesday, 73 full days will have elapsed since Tennessee’s last loss. This is Tennessee’s best start to SEC play since it won its first eight league games in 1981-82. The Vols have shot 50 percent or better 15 times this season and rank second in the country with a .516 field-goal percentage. Point guard Jordan Bone owns the sixth-best assist/turnover ratio in the country (3.56). In his second season with Missouri (11-9, 2-6 SEC), Cuonzo Martin is set to make his first trip back to Thompson-Boling Arena since parting ways with Tennessee in 2014 after a Sweet Sixteen run. Mizzou owns wins over Illinois, Oregon State, Texas A&M and Xavier this season and enters Tuesday’s matchup on the heels of a 77-67 win over Vanderbilt on Saturday. Jordan Geist has been the best player for Missouri so far, leading the Tigers in scoring (13.9 ppg), assists (3.2 apg) and steals (1.1 spg). The senior guard has five 20-point performances this year. Mark Smith (12.6 ppg, 5.5 rpg, 1.6 apg) is close behind Geist in the scoring column. The two have combined for more than half of the team’s 3-pointers this year, accounting for 89 triples between the two. Smith paces the Tigers with 48 treys while shooting at a 46-percent clip from beyond the arc. Sophomore forward Jeremiah Tilmon (10.9 ppg, 5.9 rpg, 0.7 bpg) rounds out the double-digit scorers for Mizzou. He has four double-doubles this season. Missouri doesn’t have a high-scoring offensive scheme, ranking last in the SEC with an average of 68.4 points per game. However, the Tigers are the best team in the league when it comes to shooting from beyond the arc. MU is shooting 38 percent from deep. On the other end of the floor, Mizzou’s tempo and solid defense has caused its opponents to struggle on offense, as the Tigers rank fourth in the SEC in scoring defense, allowing only 68.0 points per game. No. 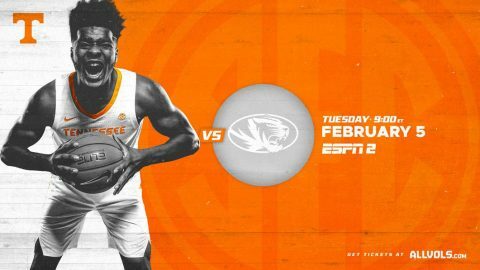 3 Tennessee rebounded from a slow start to cruise to an 87-63 win at Missouri on January 8th, 2019. The Vols extended their winning streak to nine games with the victory. UT’s 87 points were the most the Tigers had allowed through that point in the season. After going down by nine early on, Tennessee rallied to the 24-point win on the road. Kyle Alexander posted another strong performance in the paint, recording 14 points, a career-high 17 rebounds and three blocks for his third double-double of the season–and second in a row. Jordan Bowden dropped a game-high 20 points on 7-of-12 shooting in 26 minutes of play. Jordan Bone added 17 points, five rebounds and five assists. Admiral Schofield posted an all-around performance with 16 points, nine rebounds, four assists and two steals. For the sixth consecutive game, Tennessee scored 80 points and shot better than 50 percent (31-of-58) from the floor to find the win column. Mizzou had all the momentum to begin the game, taking a 27-18 lead behind five 3-pointers. However, the rowdy crowd wouldn’t rattle Tennessee, who answered with a 13-0 run of its own to retake the lead. After a 10-of-19 shooting start for MU, the Big Orange settled in on defense and didn’t allow a basket during the final 7:04 of the half. UT knocked down eight of its final 12 shots and ended the period on a 24-4 run to lead 42-31 going into halftime. Second-year Missouri head coach Cuonzo Martin was the head coach at Tennessee for three seasons from 2011-14. Martin led the Vols to a 63-41 (32-20 SEC) record and a memorable 2014 NCAA Tournament run that began in the First Four and ended in the Sweet Sixteen (one possession away from the program’s second all-time Elite Eight appearance). On April 15th, 2014, it was announced that Martin had accepted the head coaching job at Cal, where he spent three seasons before transitioning to Mizzou. Knoxville native Rob Jones totaled 14 points, 11 rebounds, one assist and a team-high three blocks against the Tigers December 10th, 1984, in Columbia, but it wasn’t enough, as Missouri posted a 70-61 victory. Five Tigers scored in double figures in the win. Mizzou had no answer for the great Bernard King, as the legendary Vols forward recorded a double-double with 32 points and 18 rebounds in a 99-77 Tennessee triumph at the Big Sun Invitational on December 21st, 1974 in St. Petersburg, Florida. Two-time first-team All-SEC honoree Mike Edwards tallied a team-high 19 points against Missouri during a 67-57 loss to the 12th-ranked Tigers in the 1972 Vol Classic title game in Knoxville on December 16th, 1972. In the first-ever meeting in this series, 6-10 Tennessee center Orb Bowling led the Vols in scoring (12) and rebounding (8), but Missouri managed an 86-61 win on December 20th, 1961, in Knoxville. Tennessee is 7-5 all-time when facing a team led by a former UT head coach. This is the third time the Vols will oppose Cuonzo Martin since his tenure at UT ended. HEAD COACH LATER COACHED AT TENNESSEE’S RECORD VS.
* Martin suffered a loss with Missouri State (11/17/11) prior to his tenure at UT. Tennessee is riding a program-record 16-game win streak. It is the longest active win streak in Division I. The Vols’ eight-game active win streak in true road games also is the longest in Division I and the second-longest in program history. Tennessee’s 20-game home win streak is the second-longest active streak in Division I. Houston has won 30 straight at home; Buffalo, like UT, has won 20 straight. Point guard Jordan Bone—touted by Rick Barnes as the team’s most improved player prior to the season—is the sparkplug of Tennessee’s offense. In addition to averaging a career-best 13.6 points, Bone leads the Vols with 6.6 assists per game (first in the SEC) and a 3.56 assist/turnover ratio (first in the SEC). Bone’s 139 assists have directly led to 322 points. Coupled with his 285 points scored, he is responsible for 33.4 percent of the team’s scoring (607 of 1,820).